The above video is a promo clip I put together for the musical we're presenting a week from today, "Fat Fat Jehoshaphat"! We'll be showing it at church on Sunday. I thought you might enjoy seeing a little bit of what we've been working on. The video quality really went down when I uploaded, but you can see it bigger here, and it at least gives an idea of what we're doing! 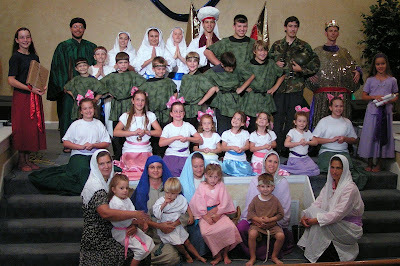 This musical has taken a lot of work, between arranging all the practices, planning rehearsals, directing, choreographing, finding and arranging props, decorating, and sewing many costumes (2 skirts, 7 army tunics, 1 kingly robe, 1 historian's hat, 1 sash, and 3 white head scarves to be exact!). I think I forget after each musical just how much work has to go in to putting one on, but that's probably a good thing. =) If I remembered all the work, I may think twice before doing one again! But, God designed us in a special way to mostly forget the bad and remember the good. Despite all the work, this musical has been so much fun to put on! All of the families have really pulled together, and I've so enjoyed working with them each Tuesday and Thursday. With all the funny lines and hilarious characters, this musical has been one of the most enjoyable for everyone to work on. Though I'm not acting in it this time, it's been great to see each actor blossom in their roles. We're looking forward to presenting it in a week! We've used almost everyone in each family involved! It's been fun to have each person be in or help with it in some way, and families have done really well working together, despite the wide age ranges! I wish I lived close enough to come watch! I will be praying that all goes well! It has been a lot of hard work, but it will all be worth it! I enjoyed the promo video, Anna. Can't wait to see it next Saturday. It feels SO STRANGE to not be involved in this production, though. Ella: Thank you for your prayers - I really appreciate them! Mrs. Hart: Yes, it has been really weird not having your family involved! I've missed you all, but there's some great families in it this time as well!